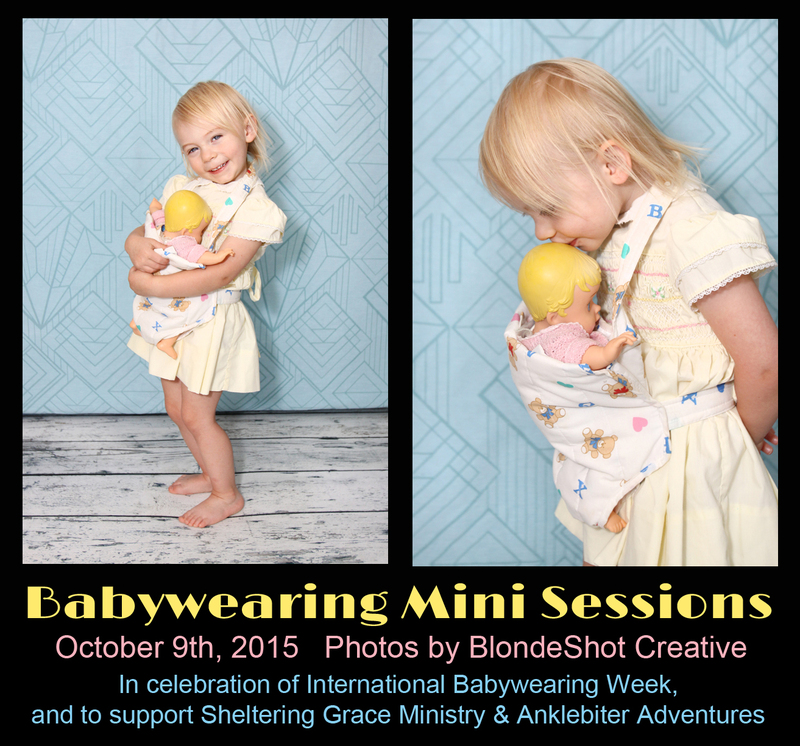 Babywearing Mini Sessions- Preview and Now Booking! International Babywearing Week is coming up in early October, and we're partnering once again with Anklebiter Adventures! They will be posting lots of great information on the topic, having giveaways, and hosting BW events that week, and one of the included events is a fundraiser, babywearing portrait sessions, which we'll be shooting! We are raising funds to purchase baby carriers for Sheltering Grace Ministry, a local women's shelter that specifically helps new mothers get back on their feet. We've also partnered with a great carrier company and are hoping to buy as many carriers as possible, both for the new mothers, and for the staff that looks after the babies while the mothers are out job hunting during the day. BlondeShot Creative will be donating 100% of our time to take the photos for these sessions, and we have a few spots left to fill! If any of our friends or followers are interested in getting either your photo taken wearing your child (we have infant and toddler carriers you can borrow), OR a photo of your child wearing their doll or stuffed animal (we have a kids carrier you can borrow too! ), please let us know so that we can send you the details and reserve a spot for you! This is a great event for a great cause, and you get a fantastic memory in exchange! It's only $30 for a session, and I'm happy to email more details. The sessions will take place on Friday, October 9th. If you can't make it but would like to help us in our fundraising goal anyways, we'll also gladly accept donations. If that date doesn't work for you, we're offering two additional mini sessions during the month of October on your choice of available dates for an additional fee (but still at a discounted rate). 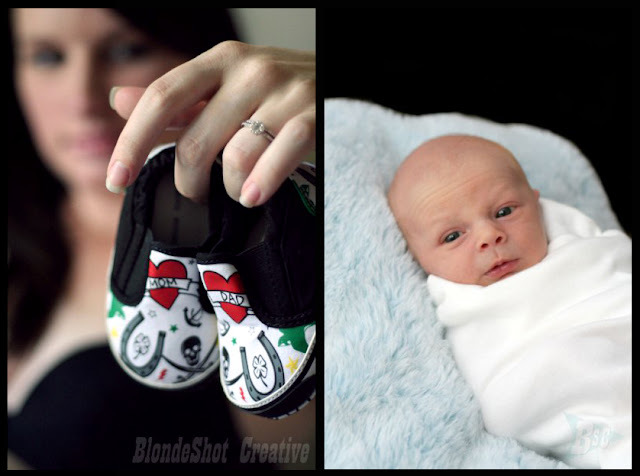 Please email us at blondeshotcreative(at)gmail.com for more information or to book you spot. The blue background in the above photos is this years choice background. To view selected photos from last years sessions, click HERE. It's loads of fun to capture both your child's growth, and their little personalities at each age and compare with other years. The time goes by so quickly, and once those yearly milestones are gone, they are gone. Being able to have photographs of these times will be something you can look back on for years to come. Plus, who doesn't love being spoiled on their birthday? Let's work together to make your little sweetie feel extra special for their special day! 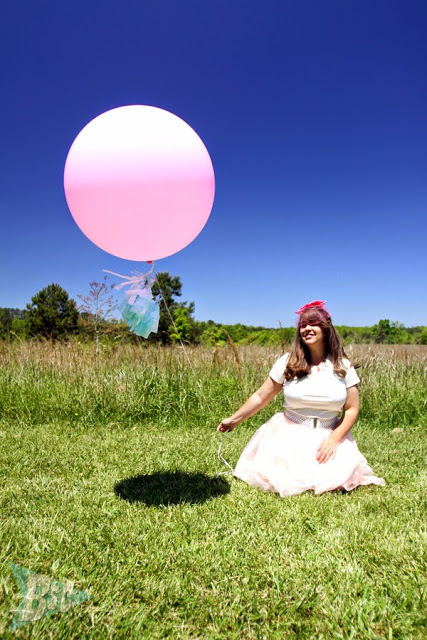 Clients often like to bring other birthday related props as well, like balloons, favorite toys, or gifts. 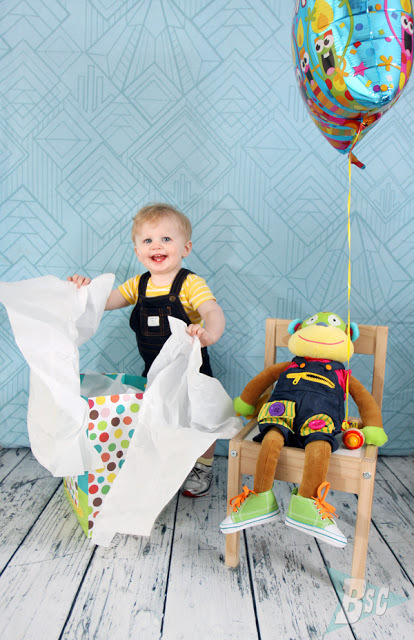 Bringing a favorite toy is both a great way to help them feel comfortable and safe in front of the camera if they are not used to it, and a great way to capture their changing tastes and preferences from year to year. 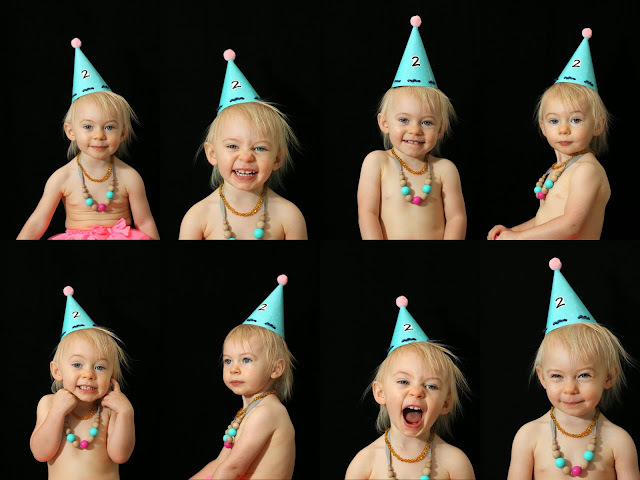 P.S.- We can even do birthday sessions for adults, and on-location birthday sessions as well! Maternity sessions can be magical for so many reasons... they can be a great way to capture a special time in your life, a way to make you feel prettier, more confident, and empowered at a time when you normally might not feel so great (you know, when your ankles are swollen and you can barely walk anymore), a great time to bond with your baby and/or your partner, and a calming moment before you welcome a new life into your world. Pair those photos with the first pictures of your newborn love, and you can make it even better! Displaying two photos in side-by-side frames on the wall, or as one single diptych can work together beautifully. You can even choose similar (or the same) backdrops, clothing choices, or color palettes to carry over design elements from one shoot to the next. The combo. 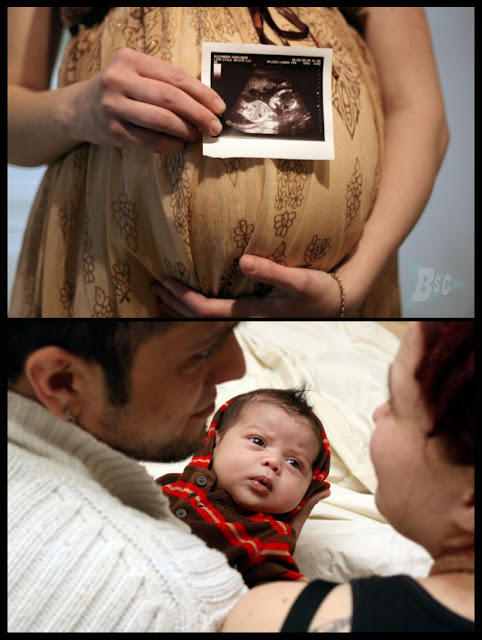 of the two sessions also works great for birth announcements and baby books! 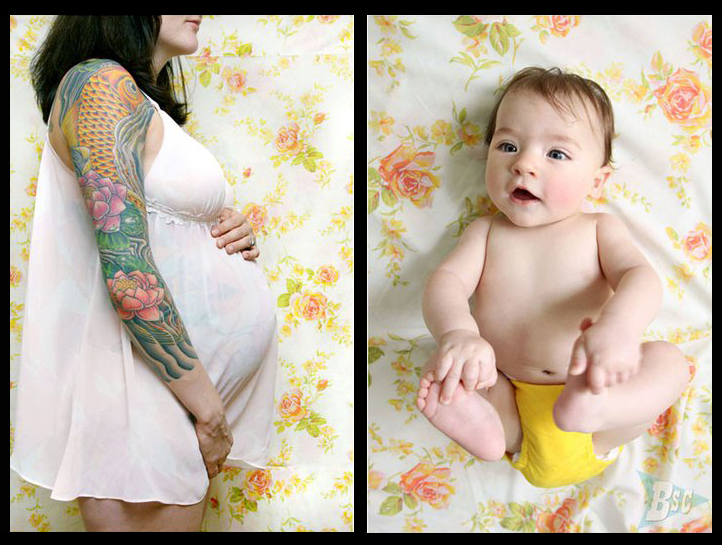 Don't feel like showing much of yourself in your maternity photos? No problem! We can focus on the baby-bump or baby-related items, or even do some unique silhouettes! Birthday Celebration packages are $150 (valued at over $175), and Before and After packages are $300 (values at over $365). To receive special discounts, please sign up for our email newsletter, and follow our Facebook page for the goods. 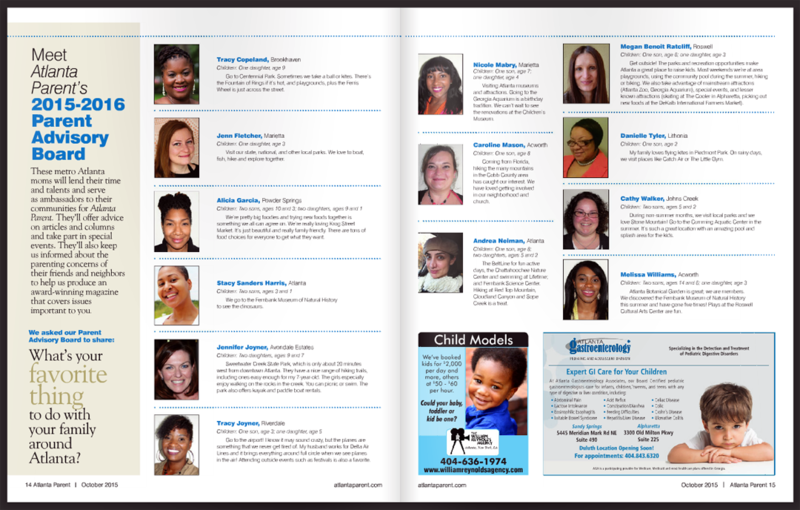 Find information on more of our specialty packages here.